back issues from Rich Shepler. As an organization, the Remington Society has been in existence since 1981. In its first seven years, the organization published infrequent letters and an occasional “fact sheet” on Remington-related topics. Beginning in 1988, the Remington Society started publishing a quarterly RSA Newsletter. These were initially 4-page photocopied handouts, but within a few years they expanded to six pages. In April 1991, the first RSA Journal was published. It began as an 8-page magazine, and later grew to twenty, then thirty, and then sixty pages! Many feel that it is the premier gun collector’s magazine! 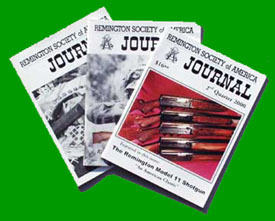 The RSA has a limited number of back issues of the Remington Collector’s Journal available. Cost is $5 each plus postage. How can I submit an article for a future issue? How can I purchase back issuesof the RSA Journal?